Emily Filler’s paintings maintain the fragile balance between the real and the imaginary. There is a sense of the familiar, but also a dream-like quality: flowers are the jumping off point to a world that dissolves into abstraction. The artist weaves together painting, printmaking and photography in her “painterly collages,” bringing together panels of color, meticulous patterning and floral elements. 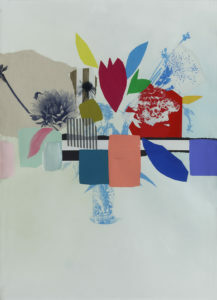 Dense mark-makings are contrasted with airy clouds of transparent colour, and screen-printed florals reveal themselves from behind cut and torn paper and canvas. As these processes and elements interlace, they create a hybrid between representation and abstraction, the natural and supernatural. A rising star on the Canadian art scene, the Toronto-based artist graduated from Queen’s University with an Honours Bachelor of Fine Arts. In 2018, she had two solo exhibitions, one at Caldwell Snyder Gallery and the other at Newzones Gallery. Filler is currently represented by Newzones Gallery (Calgary), Caldwell Snyder Gallery (San Francisco), and Kahn Gallery (London, UK).